It's a scarf. No, wait! It's a necklace. I really love these. 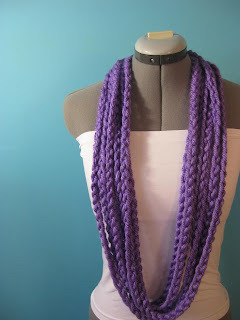 I think they're a really innovative and colorful idea for dressing up an outfit, and since I love wearing scarves, you can imagine that I think a crocheted necklace that has a very similar "look" would be right up my alley. Today's shop has lots of these, too, in a wide variety of colors which, for me, is another huge plus because I'm all about color. Today's featured artisan, the wonderful woman that makes these beautiful creations and many more crocheted items that are sold in her Etsy shop, is Laci from ZigZags123. Laci is a full time mom of three who somehow also finds the time to create all of these beautiful pieces and run her shop on Etsy as well. Her shop is filled with hats, pincushions, hair bows, crocheted necklaces in a number of different colors and styles as well as a variety of other items to browse through. Be sure to stop by and take a look! 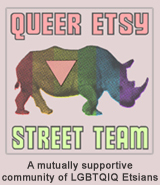 YOU CAN CLICK ON THE PICTURE ABOVE TO VISIT ZIGZAGS123'S SHOP AND TAKE A LOOK AROUND OR, IF YOU PREFER, CLICK RIGHT HERE. I love her Skinny Edition ones - so wonderful! super cute and great feature! Very nice creations. Love the cactus pin cushions. So cute! Excellent write-up too! I love ZigZags...make great pincushions too!